I had an amazing 2018! – Submitting to former Mayor Megan Barry small business policy recommendations as the Small Business Team Lead on the mayoral Taskforce for Transit and Affordability. 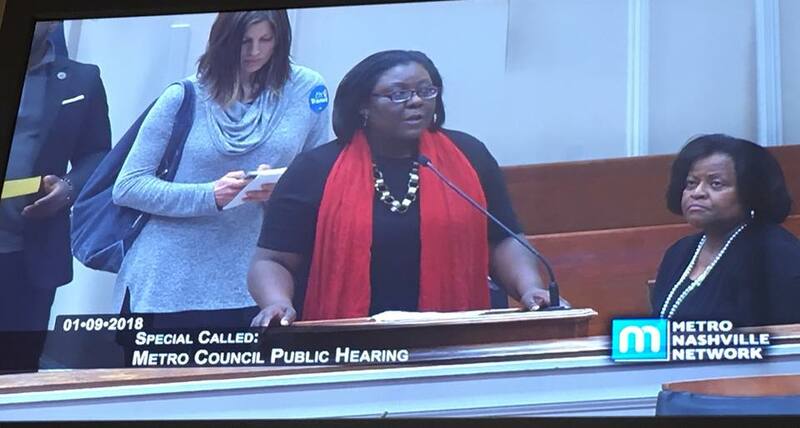 The taskforce was charged with putting together policy, programmatic, and partnership recommendations to mitigate the displacement of residents and businesses along high-capacity transit corridors should the city decide to move forward with the robust Let’s Move Nashville transit plan. Our recommendations were amazing and would have been effective if implemented; I wish more people took the opportunity to review them. – Participating in the Nashville Area Chamber of Commerce’s inaugural Leadership Connect cohort. This cohort is specifically designed to accelerate the pathway of community leadership for business owners who are already committed to doing the heavy lifting in their respective communities. We have the Best Cohort Ever. I love Amr, Chris, Ashley, Tonya, Harry, Phil, Courtney, DJ, and LeShane. – Joining the board of the Nashville Black Chamber of Commerce. I see my membership as one of the Board of Directors as an opportunity to fulfill one of my lifelong goals: ensuring more minority business owners have an equitable opportunity to create jobs and wealth. I vow to use my tenure as a pathway to create economic prosperity for businesses and individuals. – Coordinating the #ContractingforEquity Legislative Day on Capitol Hill to advocate for an amendment to the Tennessee Women Owned, Minority Owned, Veteran Owned, and Small Business Procurement and Contracting Act. The day brought business owners who would otherwise not interact with policymakers and gave them tools to push for needed change. – Accompanying the Nashville Area Chamber of Commerce as part of its Leadership Study Mission delegation to Seattle. This trip was awesome. We learned so much about education, homelessness, and, of course, TRANSIT. – Working with Phil Cobucci to re-launch the Nashville People Project to support the May transit referendum. Our teams had the opportunity to talk with some amazing people about why the public investment in a robust transit system was worth the effort. We also got a chance to consult with Paramour Digital on some amazingly funny and inspiring transit-focused videos we released on the platform. – Being appointed by Mayor David Briley as the chair of the Minority Business Advisory Council. The purpose of the Minority Business Advisory Council is to develop strategies that will spur wealth creation for minority business owners. The role of this council is to provide insight to the city on business development opportunities; shape policy and legislation to encourage more minority contract awards, participation, and growth; report on the trends about minority business development and growth; pursue workforce development opportunities; and provide an annual report outlining the challenges and opportunities as well as potential solutions for MBE growth and development, among other tasks. – Giving the keynote address for the eighth-grade commencement for my middle school alma mater, Apollo Middle School. – Speaking twice to the Tennessee Education Lottery interns, helping them to craft their personal brands and create their own strategic plans for their lives using my custom workbooks, The Power of You and The Dream Planner, respectively. – Creating the brand new custom personal brand workbook for students, The Power of You. – Speaking twice at the Monetize Your Passion conference in New Orleans in January and Shreveport in July. – Joining the board of directors for Thistle Farms. This organization is EVERYTHING. – Traveling back and forth to Arkansas to work with a team to open two new schools. – Celebrating my 35th birthday in Punta Cana surrounded by family and friends. – Having the opportunity to travel to Washington, D.C. for the first time to attend the Friendship Convocation. I was also stoked to tour several museums including the National Portrait Gallery, Newseum, and the National Museum of African-American History and Culture. – Attending the Congressional Black Caucus policy forums in Washington, D.C. for the first time. – Speaking at the Ad women for All Women Conference. The conference is designed to introduce female college students to the ad business and impart the value of women’s voices as we build a more diverse industry. – Hosting the Nashville Area Chamber of Commerce’s Annual Celebration with my best biz boo, Phil Cobucci. – Serving as Principal for a Day at Inglewood Elementary School – the same school I attended for second grade. – Standing with Mayor David Briley as he announced the business equity package for small businesses in Nashville. – Serving on the Education Report Card Committee and submitting recommendations to the community around social emotional learning – which I think is the best way to promote economic prosperity (more on that later).